Tomorrow mark's the beginning of the season of advent. A time to prepare for the coming of Jesus Christ or Christmas. It's funny how each country celebrates Advent and Christmas in its own way. Over here, the preparations all over the village begin roughly 10 days before the first Sunday of advent. The Christmas trees are planted all around town, lights put up, window shops getting ready for the season and then all of a sudden, the quiet sleepy villages burst with light, warmth and color. German homes too prepare themselves equally. 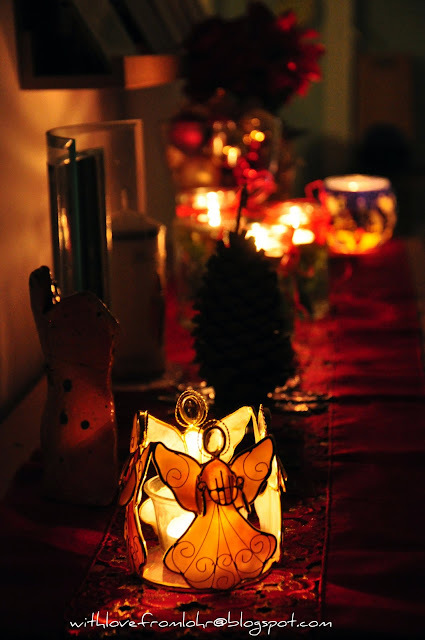 Advent wreaths are put up on doors, also the wreath with four candles each for the four sunday's of advent are made ready, lights around the homes are put up, Christmas t-lites are lit and not to forget the ovens baking german goodies round the clock. All this festive spirit makes up for the dark cold winter and gives you a feeling of warmth within. Time and again I have mentioned how i draw inspiration from window shopping...:D I hope shop owners do not realize that somebody is stealing their ideas and sue me!!!! A lot of shops around town have placed baubles in huge glass jars, so the idea's from there!! I just love the site so much, its making up for the lack of home keeping magazines I used to buy in India. The ideas are mind wobbling!! This is how the sideboard leading to the living room looks like. Warm and cosy, lit up for the season of cheer. How are you getting yourself ready for the upcoming season?? I love your idea of using simple, clean jars to put candles in. Have to do it myself! That is so cute how you are finding ideas in store windows. 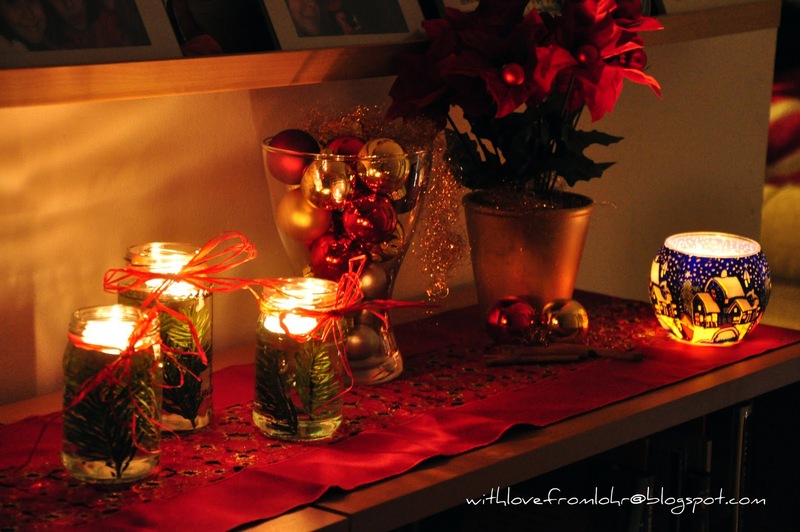 The jars of water with pine boughs and floating t lights are heavenly. You are so clever to borrow ideas from store windows, and I like the jars full of water and pine boughs with floating t candles. It all looks so lovely May. 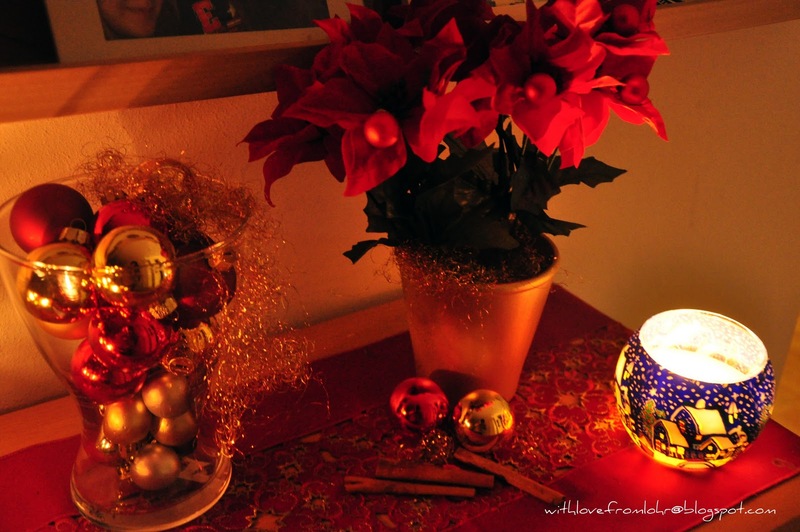 The colours and warmth of Christmas traditions work so well to brighten northern hemisphere winters. 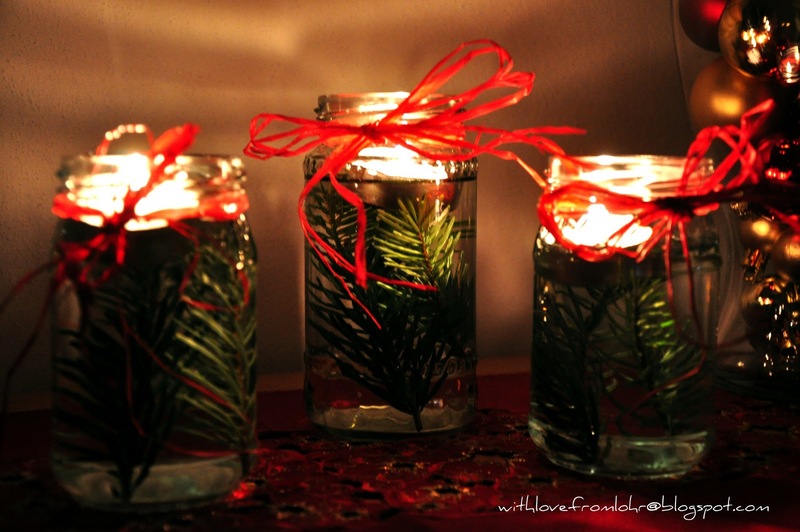 Love the idea of tea lights in jars with pine tips in water. I just put the finishing touches on our Christmas decorations...if it wasn't so dark, I'd pull out the vaccuum and just finish the job completely, but it will have to wait until morning now. I love the idea of putting greens in water with floating tea lights...OK, I'll do that in the morning, then vaccuum. Your home looks so festive and warm, just beautiful.